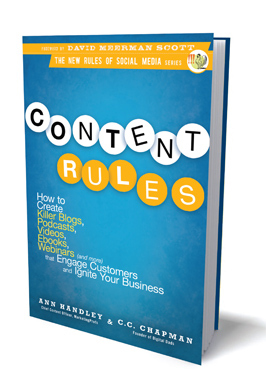 I just finished reading Content Rules, by Ann Handley and CC Chapman, and I thought I’d share my thoughts about it. Let me start off by saying that if you are new to online marketing and/or Social Media, I would 100% classify this book as a must-buy for you. In fact, if you read Trust Agents, UnMarketing, and Content Rules before your fingers first make contact with your keyboard, you’ll be ready to be a superstar right out of the gate. Why is Content Rules good? Content Rules can be used in two ways. The first way is to read it cover to cover as I did. In particular, the first part, which introduces you to the key tenets of online content creation, is an excellent introduction to creating usable, valuable material for a blog, a webinar, an e-book, or other marketing channels. What I think time will prove, though, is that Content Rules is even better as a “as you need it” resource. Section two of the book dedicates chapters to how to create content for very specific purposes. It walks you through objectives, how-to information, things to avoid, and more. So, if you are getting ready to work on your first e-book and you are feeling shaky, you can thumb right over to that chapter and feel more ready for the work ahead. The third section of the book (and technically the final one) is interesting in that it highlights a few different companies who used content creation (and the rules that Chapman and Handley outline) to find success. While these companies are mentioned at various times throughout the book to illustrate points, it’s interesting to see all of the different puzzle pieces come together. The “Ideas you can steal” section of each chapter puts the finishing touch on how you can act on the information you’ve been given. All of that being said, there were a couple of things that I think could be improved. First and foremost, the biggest plus of the book, which is that it is a must-have if you’re just getting started, is a bit of a double-edged sword. For the most part, Content Rules is not aimed at people who have been generating online content for awhile. That’s not to say there’s nothing new to learn, but a lot of the core elements of the book will be things content creators will be familiar with. I was hoping to see some advice that would help take a person like me, who’s been blogging for about a year, up to the next level.This is not really a negative thing – it just simply shows that CC and Ann had a specific audience in mind, and that is one of the rules they establish! The other thing I would say is that in a couple of places, the language gets to be almost too basic, no matter where you are in your path of creating content. This is I think an easy trap to fall into when you’re doing a lot of explaining. You start explaining things that your audience probably already knows. This didn’t happen very often, and it doesn’t deter from the value of the book, but it’s just something to watch out for. Those are my thoughts – what are yours? Have you read Content Rules? What did you think about it? I’d love to have a discussion in the comments section! Peace n prosperity Margie Clayman, I come to your website often but I am usually a lurker. I decided I’d finally post a comment for post saying how much I love visiting your blog as I think your writing is both exciting and helpful. Keep your blog up-to-date and you have a visitor for life, glad to meet you,thanks. I read content rules and I have been blogging for many years and I got a lot of value. I was familiar with most of the terms but where I got the real value was looking at it from another perspective. Helping me understand how to organize and on some occasions I identified things that did not work for me with a reason why it did not work. It also has helped me greatly in explaining why content is important to people that see little or no value to blogging or creating content that is useful for their customers. Oh, I’m definitely not saying it was without value. I’m just saying that in terms of enhancing how a person who has been blogging can improve their game, I didn’t see a lot of info there. There were a lot of interesting points, certainly. I found the section on white papers and ebooks particularly valuable! Part Three of Content Rules comprises case studies. Included with each are “Ideas You Can Steal.” I thought these alone justify the price of the book. Agreed – that was an extremely unique way to handle drawing concepts together! As always you come to the table dishing up a full course meal. I feel the same way about the book (wait you knew that already). I thought it was a really good book and would guide those that are new but I was left feeling a bit expecting more. Ann is wonderful and the articles, webinars, whitepapers, ebooks, etc that she produces on MarketingProfs are always top of the line. You walk away with a lot as it serves all levels, skill sets, etc. I was hoping to have that from the book but I did not get it. Now, let’s face it, I am by far no way an expert in social media (first because I do not believe that we can coin someone an expert when the technology constantly changes) but I feel I am well versed in quite a few areas. I wanted to build upon that the way that I do with Marketing Profs.